No compensation was received for this post. A complimentary set of tickets was provided by Canton/Stark County Convention & Visitors’ Bureau to facilitate the sharing of our experience. All opinions expressed are my own or that of my family. It was a beautiful night for a football game and my New York Giants had made their way out to Canton, OH for the annual NFL Hall of Fame game at Fawcett Stadium. Their opponent tonight: the Buffalo Bills. The game won't matter in the standings but for many of the 90+ players on each roster who are trying to make their respective teams, tonight could mean everything. For me it means a chance to see my favorite team without having to travel back to New Jersey and for my son (age 10) to attend his first NFL football game. Joining us at the game were my friend and his son - both Bills fans. How convenient. We arrived at the Pro Football Hall of Fame complex about 90 minutes prior to kickoff and started to look for parking. Since Fawcett Stadium is a high school stadium, it's not very well equipped to handle a large number of vehicles and so, for what I would imagine is a once yearly occurrence, property owners nearby the stadium rent out their driveways and lawns for people to park at a cost of between $15 and $20 a spot. We parked and made our way into the stadium. Once inside we decided to take a walk around the stadium, check out the concessions and essentially see all that we could see. 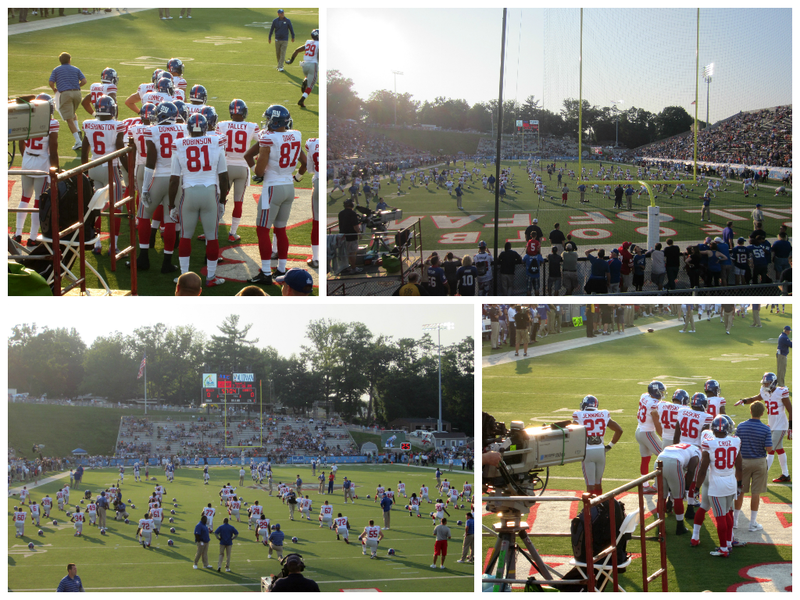 We snapped a few photos of the players warming up and then decided it might be a good idea to go find our seats. As we were walking back toward our section, it started to become very clear: the stadium was starting to really get crowded. We got to our section - #23, behind the near end zone - and took in the pregame warm ups. About 10 minutes before kickoff we decided to head down from our seats to grab a drink. Getting back to our section proved to be a bit of a challenge. Originally built as high school stadium that sat 15,000, additional seating was added to expand the capacity to over 22,000. However, the concourse was not intended to handle crowds of that size. Due to the layout of the stadium, access to some of the sections are limited by several gates that create a small "chute" style walkway that can only handle one-way traffic. This means that people on either side of the chute must wait for those coming in the opposite direction to get through. It's akin to a one lane road with traffic being regulated by a traffic cop. It was frustrating to have to wait, but eventually we were able to make it back but to our seats. This one-lane traffic pattern continued throughout the evening, whenever we ventured from our seats. Despite the fact that Fawcett is an old stadium, you'd think this is something that they could come up with another solution for. While we were waiting in line to return to our seats, several parachutists dropped in to Fawcett Stadium - a sight to behold. It looks so much easier on television but watching in person - the amazement factor goes up by a thousand percent. It was a very cool thing to see. We ultimately did return to our seats in time for kickoff - the moment had arrived for my Giants to beat up on the Bills. Some people told me that since Fawcett is a high school stadium there are really no bad seats in the entire place. Being seated in the end zone did have it challenges, it was a little difficult to judge depth on the field and often our view of the action was blocked at just the right angle by the goalpost crossbar. We did, however, get a great view of Corey Washington's 73 yard TD reception (which gave the Giants the lead and the win) but action near the other end zone was not the easiest to see. Towards the end of the game we decided to make another brief trip to the concourse before heading back to our seats for the final two minutes of action. Unfortunately, as we were heading back, we found that the walkway back to our seats was completely blocked off. The reason, we were told, was because they needed to keep the section clear for when the players ran off the field. I understand why this has to happen but it didn't make me any less frustrated that we couldn't return to our seats for the end of the game. Essentially we missed the last 2-3 minutes because we were not permitted to return to our seats. However, this negative situation soon turned into a positive experience. 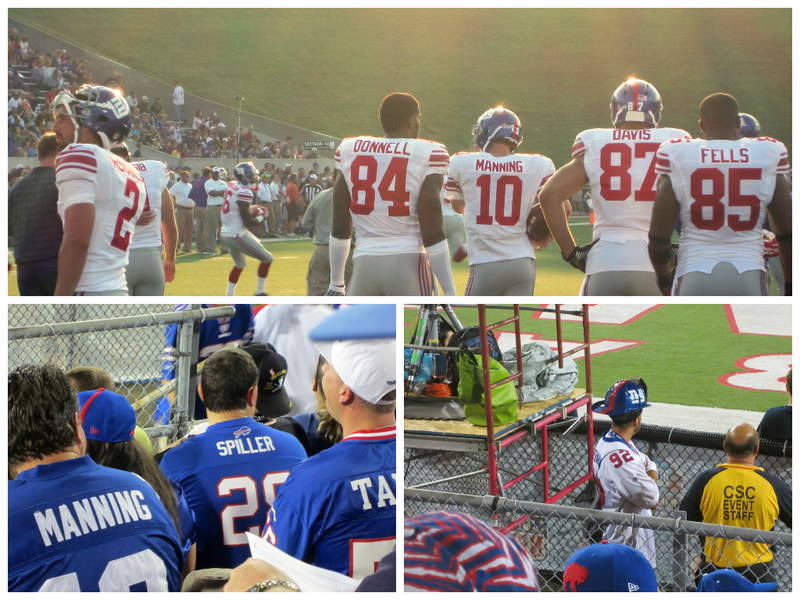 Sure, we missed the end of the game, but now we're in a prime spot to see all the Giants leave the field. A few Giants came over and signed for some fans and Eli Manning ran over and tossed his wristbands to a young fan who was sporting a Manning jersey. After the team had left the field, former Giant and current analyst Carl Banks meandered over and signed for a few fans - including us! As an older Giant fan, I thought it was pretty cool to get #58's autograph. My son received a brief history lesson on Carl Banks during our exit from the stadium. As we made our walk back to the car, we took the opportunity to review the evening's events. We all agreed that we had a fun time at the game. Even my son, who in the days prior to the event couldn't muster a ton of excitement about it, had a lot of fun. For me, it was about seeing the Giants. I don't get to New York often (if at all) and a chance to see the Giants play is hard to pass up. This will forever be remembered by my son and me as a great father/son bonding experience and for that I'm thankful. And if the Giants win it all this year we can look back at this game and say that it all started in Canton, at the Hall of Fame game, with a victory over the Bills. No compensation was received for this post. A complimentary sample was provided for the purposes of this review. All images courtesy of Little Green Pouch. It seems to me that lately, there are more and more items available at the store in pouches. I think I first tried a pouch product in the baby food aisle. I thought the concept was interesting, a squeeze pouch that could allow your young child to feed themselves fruits or vegetables without the need for a spoon. Then, I tried a product that was designed for adults - I can't remember the brand now, but it was a during exercise type of snack that would give you energy on the go. I liked the idea of a snack that I could put in the bag on my bike and enjoy on the way. 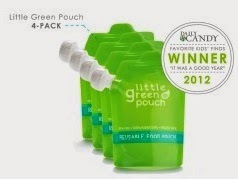 A while back, I was contacted by someone from a company that is offering a new product - Little Green Pouch. The product is a reusable pouch, that is dishwasher and freezer safe. It opens at the top with a interlocking zipper bag closure (like on your sandwich bags), to allow for easy filling of the pouch. I told them that I would love to try this product and share it with my readers. The pouches are very easy to clean. I cleaned them by hand the first time and then used my dishwasher. The zipper opening allows you to easily fit a bottle brush inside to clean. Trying to reach your hand in with a washcloth is a little bit harder. The dishwasher - simple. Open up your pouch, invert it and place over one of the tines in your upper rack. The opening created with the zipper, allows for the pouches to easily be filled. They even have a little picture on the back of the pouch to suggest that you use a spoon, a funnel or a pitcher to fill. We tended to fill most with a spoon, or a pitcher (blender). Once filled, seal the zipper and remove the cap on the spout to enjoy the contents. Each pouch can be filled with up to 7 oz of product, but I found that closer to 4 oz was the level to which I could fill and have the contents consumed. Coincidentally, this is also close to what are found on many of the other pouch items. The pouch does have a graduation on the back that shows you 2 oz increments, as well as the 7 oz max fill, which takes the guess work out of filling the pouch. Each pouch also has a label spot on the back, so that you could mark whose pouch it was. I don't know about your house, but at my house it seems to be very important to my kids that they don't share a straw, a spoon, or cup...so this makes it an easy way to keep each person's pouch as their own. We filled our pouches with an assortment of items. I liked that not only could I choose what to put in them, but also that I had more control over the ingredients and texture (some of the pouch items that I have bought and tried were too smooth, I like a little texture to my nourishment). I used them for yogurt - easy to consume and a great way to eat it on the go. We mostly enjoy blended yogurts at my house, so there weren't to many pieces of fruit...if you used fruited yogurt, might have to check and make sure it won't clog the spout. I also used them for pudding when I made some homemade pudding for the kids. We used them for smoothies, which we are a big fan of at my house. It is not only a great way to use up the assorted fruit in the house, but you can even sneak in some veggies for more nutrition. Looking for more ideas? On their website, they offer several recipe ideas for things to make and fill in the pouches. They have recipes for sweet and savory - one savory option that I noticed is Chicken, Sweet Potatoes and Kale puree. They even have a separate search to find Paleo friendly recipes. I really think that the options are endless...anything you can puree, can go in the pouch. What would you put in your Little Green Pouch?